Usable up to balance only to buy goods or services at participating Domino’s stores in the U.S. Not redeemable to purchase gift cards. Not redeemable for cash except as required by law. Not a credit or debit card. Safeguard the card. It will not be replaced or replenished if lost, stolen or used without authorization. CARDCO CXXV, Inc. is the card issuer and sole obligor to card owner. CARDCO may delegate its issuer obligations to an assignee, without recourse. If delegated, the assignee, and not CARDCO, will be sole obligor to card owner. Resale by any unlicensed vendor or through any unauthorized channels such as online auctions is prohibited. Purchase, use or acceptance of card constitutes acceptance of these terms. 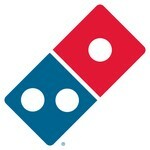 For balance inquiries go to www.dominos.com or call 877-250-2278 and for other inquiries visit www.dominos.com. Domino’s IP Holder LLC. Domino’s®, Domino’s Pizza® and the modular logo are registered trademarks of Domino’s IP Holder LLC.